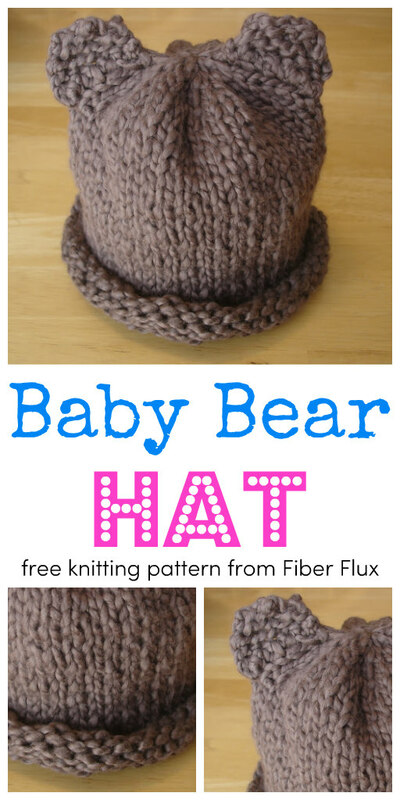 Fiber Flux: Free Knitting Pattern...Baby Bear Hat for Preemie, Newborn, and Baby! Free Knitting Pattern...Baby Bear Hat for Preemie, Newborn, and Baby! Make a trip to your yarn stash for the perfect bear colored yarn and knit your little bear a cozy and super fast hat. Tuck the hat in with a new baby gift or make for your favorite charity. Instructions included for both preemie and newborn sizes. CO 40 sts for preemie or 48 sts for newborn/baby, leaving a long tail for seaming up later. Work in st st until hat measures 6” (both sizes) from CO edge, ending on a WS row. Using tapestry needle, break yarn leaving a long tail. Thread through remaining stitches and pull tightly. Seam up the back of hat and weave in ends. Work in st st (knit all rounds) until hat measures 6” (both sizes) from CO edge. Using tapestry needle, break yarn leaving a long tail. Thread through remaining stitches and pull tightly. Note: Ears are worked in garter stitch to make them nice and sturdy. Seam hat and stitch both ears to top of hat with tapestry needle and matching yarn. Weave in any ends. Love the pattern! So cute! But when decreasing the top of the hat, is Row 5 supposed to be K1, K2tog around? Because I have 13 remaining stitches there (newborn size). Thanks again for the pattern! Hmmm...I'll have to check on that, thanks so much for pointing it out, I appreciate that. For now though, you could get away with the odd number of remaining because you can draw any number of stitches to finish the top. Thanks again for your eagle eye! Is it possible for you to adjust the pattern to an adult size for me. Hello! I am also a new knitter with a 7-month-old baby, a 4-month-old niece, and a 2-year-old niece. I'd love to make them all hats for Christmas this year, and love this one - so adorable! I think they would all love it! I'm just not sure how to adjust the pattern size for each of them. Would you be able to adjust the pattern for me, too? I think a 6-12 month size would work for the two babies, and a 2-year old size would be perfect for my older niece. You can email me at amyjaredyost@gmail.com. Thanks so much! Hi! I have a light baby yarn that I would really like to use for this hat, it is a "light 3". Is there a way to alter this pattern to use this yarn for a newborn hat? The hat is so cute! @ Amy I'm fiddling with the math and will email you soon! @ktmarie71 the easiest thing would be to hold the yarn double...do you have anough yarn for that? If not, let me know, we'll figure something out! Thanks so much for getting back to me so fast! I have only completed a few projects and am still learning, so forgive me. What does hold the yarn double mean? I have plenty of yarn. :). Thanks again for the pattern and your generosity of time figuring this out! I could always buy new yarn if needed. I just like the colors I currently have. Hold two strands at once, making the yarn twice as thick. Use two skeins at once. If you only have one skein, pull from the center, and the outside at the same time. If you have one ball, roll half of it into another ball. Cast on with double strand. Make sure you pick up both loops each stitch. Sometimes I will do this if I need thicker yarn too! Let me know if I can help in any other way and happy knitting to you! Hi there! This is adorable. I'm hoping to make this for a nephew who's about 8months old. Do you think you could also send me the adjusted pattern for that size? I'm guessing it would be the same as what you sent Amy above? My email address is ms.jacob@gmail.com. Thank you SO SO much, I really appreciate it! @ Ms.Jacob...just sent you an email, you are so welcome, and thanks to you for your kind words! I'm new to knitting and have a question. For rows 1 and 3, do you k1(k2) once and then k2tog the rest of the row? Or do you alternate between k1(2) and k2tog for the whole row? Thanks in advance! Thank you so,so much for sharing this pattern! This is only my third project but it turned out amazingly cute! My second son is due to be born March 4th and I can't wait to put him in this hat. Will start working on your bunny hat pattern for Easter very soon! Thanks again. This is such a cute hat! I wanted to make this for a number of people in my family. Could you also send me the adjusted adult and small children sizes as well? wahleeanna@gmail.com. Thanks in advance! @ Megan T...You are so welcome! Congratulations to you! Hi! Do you think bulky (5) yarn would work if I used size 9 needles? I am planning to make a newborn size. Thanks! @ WD...Sending you a message and...done! @ Anonymous...not really sure, the best thing to do would be to knit a swatch and see if you can get gauge, that way you can be absolutely sure. Hey, Jennifer! could you please send me adjusted sizing for a 2 year old? (maggs4408@hotmail.com) I love your patterns! Just made the bunny for a friend having a baby in April! Thanks again for sharing! Done! I just put it on the blog for everyone! It can be found it the "Free Knitting Patterns" tab as well. Hey Jennifer, I also need an adjusted sizing for a 5 year old....such cute and not difficult patterns...YEAH! Could I get the bunny pattern adjusted to a 5 year old also? Many thanks! Done! I just put the bear hat on the blog for everyone! It can be found it the "Free Knitting Patterns" tab as well. PS you can use the bear hat pattern for the bunny hat, ears would be the same as the original bunny pattern. Hi, I would love to make this hat for a a few of my friends that are about to have babies, but I'm quite new to knitting and I'm a little confused as to what yarn to use. I live in the UK could you recommend a brand and yarn that would be suitable for baby hats? Because this hat is knitted with US 10.5 needles, you can go slightly bulky...my advice would be to choose something worsted weight or thicker, and because it is for a baby, be sure it is soft. You can always do a test swatch to make sure it knits up nicely. can this pattern be made in the round? Yes!!! I just updated the pattern above with instructions...happy knitting to you! The pattern is here on this site, I added a link to it just now on this pattern page, just scroll up and you'll see it...you can also find it archived in the "Free Knitting Patterns" tab at the top too. I love your patterns! I am making this for a shoer gift, but sinxe we are going into spring/ summer here in california, i want to make a size 1. If you have adjusted this pattern for other sizes...can i get the different sizes? Thanks so much i appreciate it. I am on ravelry as sweetside. Thank-u! Thanks! And, absolutely, the additional sizing is on this site already, just go to the "free knitting patterns" tab and scroll down. Found you on Pinterest. I'm making two of these hats for a friend. Could you possibly e-mail me a pattern for this in a 3 month old size? This is super cute! My e-mail is bearycute@gmail.com. Thanks! Sorry, 4 month old, not a 3 month old. Thank you for the perfect pattern! I just finished my first bear hat. It's so cute and I love it! An easy way to print is to highlight needed text, select "copy" with your right mouse button, paste it to a Word document, and print. Not sure why that would happen...are you using the same needle size and yarn as the hat? Did you omit or add anything to any of the rows? Let me know and we'll figure this out together! I tried to make a preemie size on circular needles but it just ended up being a squarish piece of fabric. When you began your first round did you join to make a circle? That might be why it was square? Hi i have lots of 8ply wool could i use this and would i need to change the needle size looks like a very easy pattern and so cute. Sure! Check out the pattern (in the "free patterns" tab) called "Baby Bear for the Rest of Us" It has additional sizing beyond the newborn and preemie size. Neat! 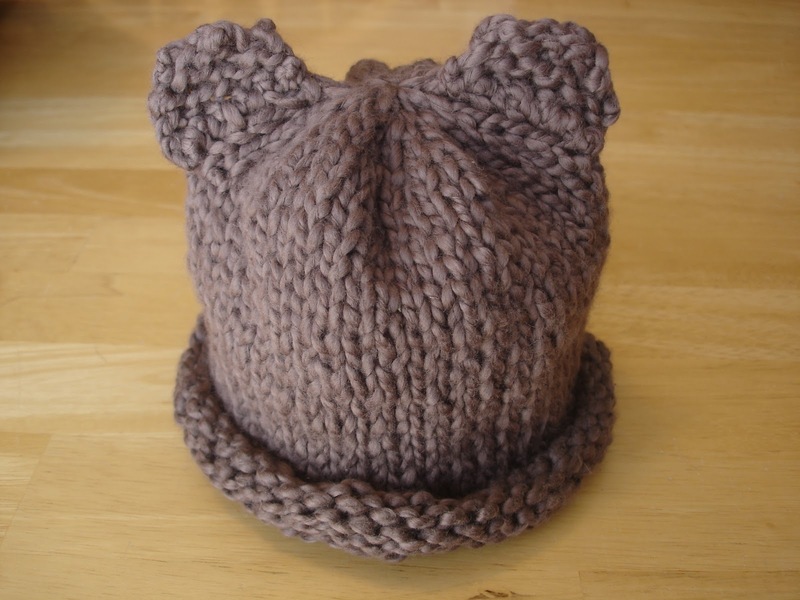 If you're doing the hat for someone who is older than a newborn, check out the pattern "Baby Bear for the Rest of Us" It can be found in the "Free Knitting Patterns" at the top of this. Just click and then scroll to the bottom of that page. The pattern includes sizes ranging from baby to adult. Hi Carol, thanks for your question, in the pattern there are instructions for both flat and in the round, that way you can choose what you like best! Hope that helps...as for the ears,you could knit a lighter one and a darker one and stack them for a two tone effect perhaps? How the heck do you download the pattern???? Hi, check out the response to the comment below...that should help. If you would like to print out only the pattern, highlight the needed text, click the right mouse button, select "copy" then paste it to a word document. That way you only have what you want and you can print or save it too. Nevermind! I found my answer above. :) Thank you! Thank you so much for sharing this adorable pattern! I am planning to knit up several of these for a local charity. Thank you again! Yellow is so cheerful, what a lovely choice! I love this hat. Is there anyway you could send me the pattern as you have adjusted it for 6-12 mo, toddler and child? I would love to make the hat in 3-4 sizes with different shades - cream, tan and brown. My e-mail is: jnorthouse@msn.com. Thanks again. Hey I'm trying to make the ears and I don't feel like Im doing it right. it looks SO small on my needles..and so loopy..am I doing something wrong? I need some help! I am a beginner knitter and I have no idea what it means to "decrease". I have the hat knitted all the way to that point but now I don't know what to do. Can someone help me with the next step? Decrease is not an instruction, just letting you know what the next section does. So on the next row, K2, then K2 together, then repeat those stitches to the end. By the end you shold have lost a quarter of the stitches, so 30 for premmie, 36 for new born. Does that help? I want to do a newborn and a baby one. But my yarn is super bulky. How much should I cast on for each. 40 looked too big but 20 looked too small. Thank you so much for sharing your pattern. I have been using it to make premie hats for my local hospital. I have 15 done so far. Just so adorable! Think I'm going to make this for my niece! Hi there! I love this pattern and just about to start this project. I have been trying to source some yarn and came across Special Thick Worsted 100% Cotton Knitting Yarn.. would this be suitable or is it too thick? Any advice would be greatly appreciated. That's why she has gven you a gauge, to see what yarn works, other than the one suggested. I have been looking for a baby cocoon pattern on line that is easy to knit. I haven't been able to find one yet but came across this adorable hat and was wondering if I could just use the basic directions to create my own. You know, kind of like an extra long hat that my not born yet grandson could go in after he arrives! I was reading some of the comments that were left and realized that you were actually responding to inquires so I thought I would ask if you have a pattern to share or if you could give me some adjustments to make a nice looking cocoon. Thanks for all your help! I do not have 10.5 needles can I use size 10? Any suggestions on how to make this more like a lion then a bear. We have a friend with a very tiny preemie whose middle name means lion. I'd love to make a very tiny lion hat for him. Any chance i could do this in DK wool instead? Hi I love this hat and my little sister just gave birth to a gorgeous and tiny baby girl. I was wondering if you could email me the adjusted patterns for both rhe adult and 5 yr old as that way I can make them for her, her wee boy and baby girl, I thought it would be cute for her wee family to have matching hats. Please and thank you. I want to make this adorable hat for a newborn and plan to use circular needles. What length needle should I get? And do I really also need double-pointed needles, or is that just an alternative way to knit in the round? I am planning to knit this adorable hat for a newborn on circular needles. What length do I need to use? And do I also really need double-pointed needles, or are they just an alternative to the circular needles for knitting in the round? I'm planning to knit this adorable hat for a newborn, knitting in the round with circular needles. What length of circular needles do I need to use? And do I still need double-pointed needles for something, or are they mentioned because they are the alternative to circular needles to knit in the round? Thanks. I'm also looking for a nice cocoon pattern. Any help is appreciated. Thank you, Jennifer. I'm a librarian at a middle school and I have a knitting club. We're finishing up scarfs and hats are next on the agenda. These will be great for showing my kids how to read a pattern and make a hat. They'll each make a hat of their own and we'll be asking them to make a hat for "Little hats, Big Hearts" for the American Heart Association.